Этот сборник эссе рассматривает различные аспекты богословия Павла. Джеймс Данн обсуждает вопросы еврейской сотериологии, оправдание верой и делами, исполнение закона, а также важную роль Христа, Его смерти и воскресения. Choosing a title for a book is always a hazardous business. It has to be a title which is informative, but which also attracts attention, rather than being dully or merely descriptive. And yet the more it attracts attention, the more likely it is to cause misunderstanding or to be misrepresented. So I choose this title, The New Perspective on Paul, with some misgivings. I do so, in the first place, since my article of the same title (reprinted as ch. 2 below) is regularly regarded as signalling a new phase in Pauline studies or a fresh way of looking at Paul's gospel and theology (or at his teaching on justification by faith in particular). Since the volume largely consists of a collection of this and twenty-one other essays which in one way or another speak to or try to advance this 'new perspective', the title could have been 'The New Perspective on Paul' and Other Essays. But that would not make sufficiently clear that the large first essay (ch. 1) is entirely new and written for the volume, and it is this new essay, 'The New Perspective on Paul: whence, what and whither? ', to which I particularly want to draw interested readers' attention. The final essay, on Phil. 3.2-14, also is written for this volume to indicate a renewed appreciation of just how effective is this summary of the full-roundedness of Paul's theology on the controverted subjects. 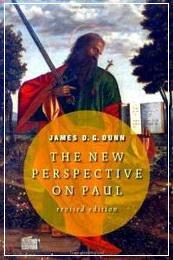 More to the point, the title 'the New Perspective' seems to have struck a chord with many, and to have become established as the most obvious referent for this different or fresh way of looking at Paul, particularly among those who are critical of 'the new perspective' (as the bibliography attests). So the reference is eminently recognizable; those for whom the volume has been put together will know almost at once what the content of the volume is likely to be. And given the controversy which 'the new perspective on Paul' has generated, it will easily be recognized that the volume is intended as my attempt to respond to the debate on the 'new perspective', as well as providing a resource for any who might find it helpful to have ready access to the full range of my developing thoughts/insights on the subject. а где еще можно почитат новый взгляд? или какой нибудь респонс?